There is no bottom in sight yet for China. Despite five interest rate cuts and traditional interpretations of monetary “stimulus”, the economy continues to decelerate beyond mainline understanding. Industrial production was just 6.1% in August, marking the thirteenth consecutive month (counting January, which is combined with February due to China’s New Year) below 8%, while retail sales rose 10.8%. Fixed Asset Investment, perhaps the key economic figure for China as it includes the real estate bubble, was the lowest growth rate since December 2000. Other indications that the economy is weakening can be seen in falling car sales and lower imports and inflation. Earlier this month, The National Bureau of Statistics reported a PPI of -5.9%. That is nearly as bad as the worst months during the Great Recession and already appreciably worse than the whole of the dot-com recession (which was likewise global). 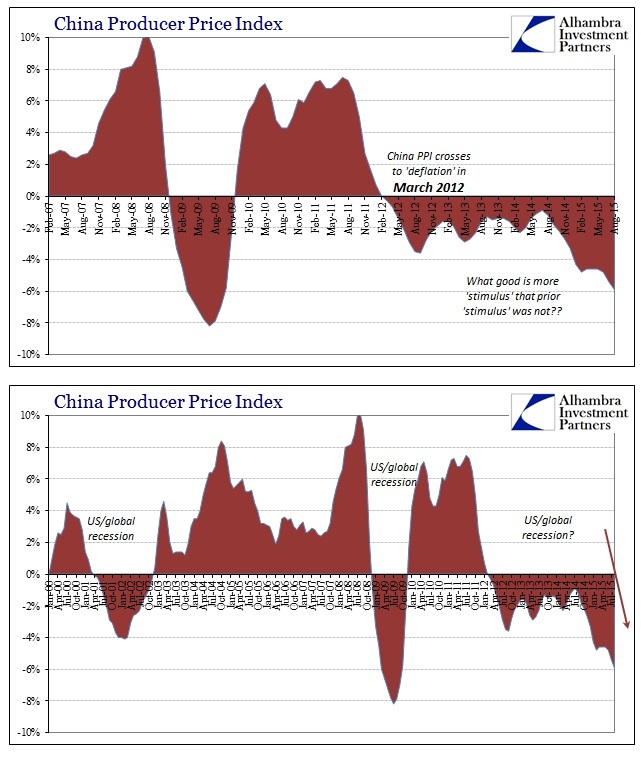 In fact, as noted last month, China’s producer price “deflation” lines up a little too closely with global recessions. In that respect, even the grudging acknowledgement in the mainstream of what all this means understates the nature of both its severity and, worst of all, how this continues to linger month after month. While the first part, “no sign of recovery”, is “unexpected” for orthodox economists it is the second, “weak side” “from domestic and overseas markets” that make this truly dangerous. In other words, there isn’t just a regional or specific nationality within a “transitory” slump but rather a global, unified deceleration that looks suspiciously recessionary except for its distinct lack of foreseeable rebound. As viewed from Brazil, the global economy continues grind slower and slower beyond the bounds of what used to be considered plain awful. 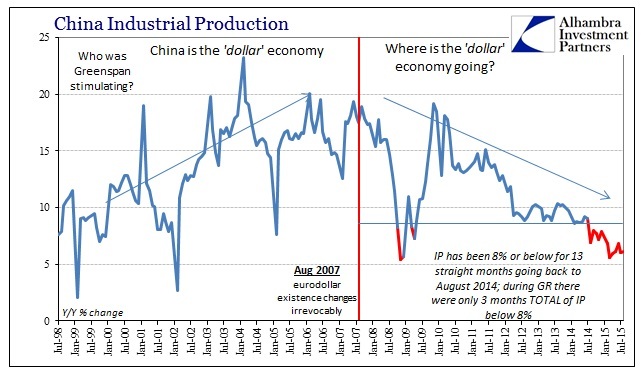 From a wholesale “dollar” perspective, this isn’t any great mystery, especially where China is concerned. China, more than any place on earth, and that certainly includes the US, benefited from the eurodollar rise in massive banking growth as if it were the long run, sustainable baseline. The interruption within the Great Recession was thought the typical recession even if monumental in its scale, and that soon China would be, as the “dollar”, restored to pre-2007 existence. To await that global economy resurrection, financialized in recovery as in prior construction, the PBOC and Chinese gov’t did as every other central bank on earth, taking what the central bank textbook declares as the correct course – “stimulus” of every kind. The fact that such an artificial baseline in construction and capacity investment yielded massive overcapacity is only revealed where global growth remains stubborn and the central bank no longer accommodates. With a massive, historic bubble being all that was gained from the post-2009 policies, the PBOC and the Communist government were faced with stark realities that are taken as impossible elsewhere (until more recently). This is the world the “dollar” has been projecting since the middle of 2013, but more succinctly and disastrously in the past fourteen months. Growth rates on industrial production, for instance, which only briefly dipped below 8% during the worst parts of the Great Recession, are now seemingly permanently under that threshold with still more downside risk. This is, again like Brazil, where the current recession in activity (regardless of any technical definitions from orthodox economists who still think none of this is related and that more than a year of serious declines is “transitory”) is in many ways worse than 2008 and 2009. 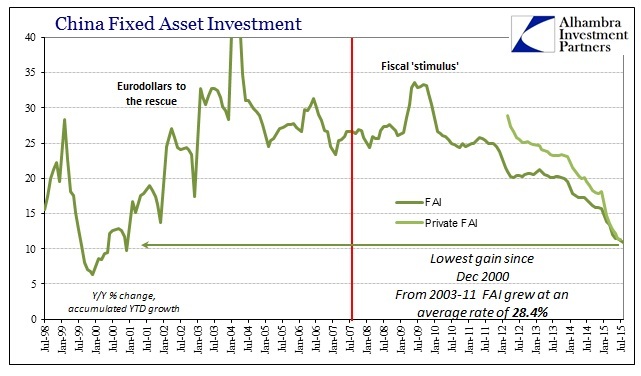 Whereas the more V-shape characteristics then plus the somehow continued plausibility of central bank “stimulus” combined to make the 30% growth world seem realistic, the current downturn is a true paradigm shift (actually, specifically, the paradigm shift was August 2007, the gaining widespread acknowledgement of that is recent). With the “dollar” bearing down on China in relentless fashion, whatever the PBOC might want to do now is easily absorbed into the global liquidity maelstrom. Despite everything the Chinese central bank has already done, including, again, five rate cuts and four decreases in the reserve requirement, yuan liquidity (durably tied to the “dollar”) continues to be highly strained. In other words, all that “stimulus” isn’t. 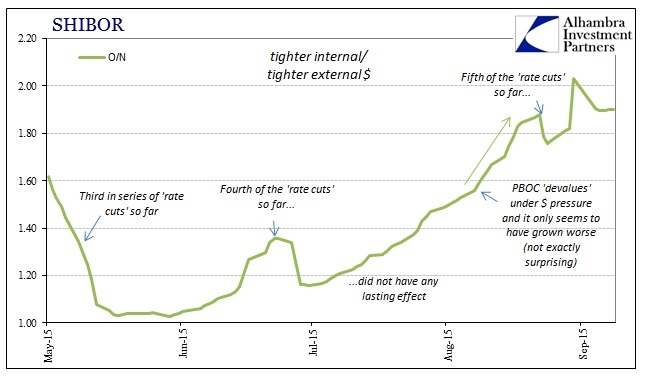 With ongoing problems in yuan liquidity due to persistent (permanent?) “dollar” funding retreat (O/N SHIBOR was again over 1.90% on Friday) and now a paradigm shift in growth expectations and reality, what happens to asset prices completely dependent on the eventual return to the baseline? The world continues to hold on now with just “transitory” as the basis; nothing else of the recovery is left even of imagination. The more this global depression lingers, the less of a baseline hold over everything. That is the true scale of the potential downside and, unfortunately, it is not China’s alone.